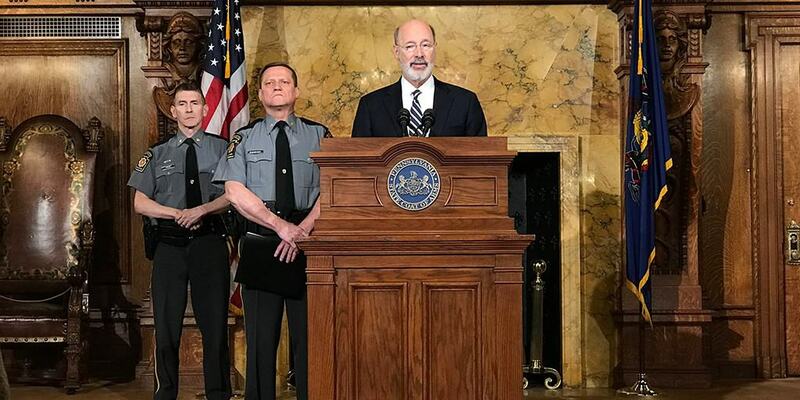 Harrisburg, PA – Governor Tom Wolf was joined today by Acting State Police Commissioner Lt. Col. Robert Evanchick, legislators and stakeholders to urge passage of commonsense gun safety legislation, including background checks on all gun purchases in Pennsylvania. “All of Pennsylvania’s citizens have the right to live happy, healthy lives free from fear about their and their family’s personal safety,” Gov. Wolf said. “Unfortunately, in the past decades we have seen that sense of security, that sense of safety, threatened. I am calling on the legislature to take up additional commonsense gun reform bills that will help us close dangerous loopholes and keep weapons out of the hands of individuals who pose a threat to Pennsylvania’s citizens. The governor also urged the House to quickly pass Senate Bill 501, which the Senate recently unanimously passed, and which prevents domestic abusers with protection from abuse orders against them from owning or possessing guns. “I ask that the House work to quickly pass SB 501, and that the full legislature get to work to help close loopholes and pass reasonable gun safety reform laws,” Gov. Wolf said.